As one of the 2008 Knight News Challenge grant recipients, Alexander Zolotarev blogs about his winning idea — the Sochi Olympics Project — on PBS’s MediaShift Idea Lab blog. In a recent post, Zolotarev talks about some of the ways he is publicizing his citizen journalism web site, SochiReporter.ru. SochiReporter is an interactive site that encourages community contribution and participation for “hyper-local” news regarding Sochi, Russia, a resort city that will be the site of the 2014 Winter Olympics. The web site consists of user-contributed photos, videos, blogs, reports, and even a wiki guidebook for the city, all enabled with social networking capabilities. In the three months since the site was launched, Zolotarev has been actively promoting his project. Some of his efforts include hosting local seminars on Web 2.0 and mobile journalism and citizen journalism, and partnering with the Sochi Winter Music Conference (SWMC), a two-day business forum and a three-day music program. He also created a SochiReporter group at Vkontakte.ru, which he says is a Russian version of Facebook. One of the most impressive publicity feats Zolotarev has pulled off is a media partnership with fast food chain McDonald’s. SochiReporter became a media partner for a Ronald McDonald House charity event and, in exchange, information about the web site was included on leaflets which were placed on every food tray in 240 restaurant locations across the country. Zolotarev explains that the collaboration had increased his web traffic by 35 percent and the uploaded content by 30 percent. The site’s “Video of the Week” feature became “Video of the Day” instead. We want people to understand that traditional media — especially TV — are paying more attention to content created by bloggers and Internet users. So if you create online content, you can get famous. Your story might be told and retold by journalists. Other local news sites have already started citing reports on SochiReporter and linking to our work, which is helping drive traffic. The goal of the site is to discuss the impact of the Olympic games and their planning on the city of Sochi over a five-year period. Zolotarev hopes that SochiReporter will provide an educational platform for its users and become a respected news source in the city. At the rate the site is developing, it could very well have a lasting impact beyond the 2014 Olympic Winter Games. You can view the English version of the site at this link. There is also a mobile version of the site. 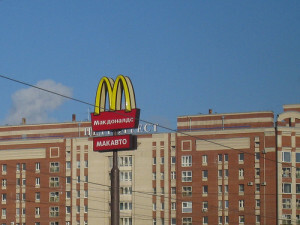 Image of McDonald’s sign in St. Petersburg by phototouring on Flickr, used with permission.